Instalment number two of this weeks’ Lakeland product reviews! And this time I got to play with gingerbread dough and stamps! This is the Say It With Biscuits Kit. Three silicone stamps, the wooden ‘handle’ that they fit on to for easy stamping, a cutter, recipe booklet and 6 very sweet gift boxes should you be able to bring yourself to give them away! It all comes packaged in a cute box so would make a great present for a baker. I used my own gingerbread dough recipe, but the booklet does contain some lovely looking recipes. It includes a sable (basic) biscuit recipe, that you could easily flavour using a splash of vanilla or almond extract, or grated zest of lemon or orange for further biscuit flavours. There is also a ginger biscuit recipe, a chocolate one (that will definitely get tried in this house, chocoholics? Us?! ), and recipes for oat and raisin, choc chip, and even a savoury cheese one. There are also ideas and recipes for filling the biscuits, should you wish to sandwich them together. So definitely lots of ideas to get you started! If you have your own favourite biscuit recipe you could also use that of course, but it needs to be a dough which can firm up when chilled, so the pattern doesn’t spread when baked. The instructions recommend chilling the dough before baking, but I’d also recommend chilling after cutting the biscuits for at least 20 minutes, especially if you are re-rolling the scraps of dough after the initial lot of cutting, as the warmth of your hands will warm the dough up too. Using the stampers is easy. They fit snugly onto the wooden handle, and you can use this to push the stamper into the dough. I would say you need to push it quite firmly into the dough to make a good deep imprint. You need to bake them for the time according to the recipe, so check that for details. You can see I have two sizes of biscuits on the picture above. The larger ones are made using the cookie cutter that comes with the kit, but I also had a go with a smaller round cutter I have to see what it would look like. I think they both look great. And if you were feeling generous and were going to give more than one away as a gift, I think the mixture of sizes would look lovely in a kilner jar with a ribbon tied around it. And if you fancy a bit of extra indulgence, how about sandwiching two together with milk chocolate ganache? Mmmmmmm!! I haven’t tried it yet, but I would also imagine that you could use these stampers with sugarpaste to make toppers for cupcakes, you would probably just need to add a smear of vegetable fat like Trex to the silicone stamper before using it to make sure it didn’t stick. The stampers have three different patterns: hearts, flowers and a Made For You stamp. They could be used on their own or together, and would make a good gift for Valentine’s Day, Mother’s Day, and birthdays….and many other occasions in between. If you like to make homemade gifts and are handy in the kitchen, this could be a good investment for you. With so many variations of flavours, stampers, shapes, and how you could package them you could produce a different gift every time! Although I was given the kit for free to review, all the views and opinions expressed are my own. The Valentine’s Collection for Marie’s Bakehouse is now available for ordering. Chocolate chip heart shaped cookies, available in white, milk or dark chocolate, and covered in heart sugar sprinkles. 6 wrapped in a gift box, £5, one flavour choice for order. 3 fudge hearts wrapped in a gift box £6.50. Available in many different flavours including milk chocolate, white chocolate, dark chocolate, milk choc and orange, white choc and lemon, milk choc with fruit and nut, dark choc and peppermint…….and many others besides…..one flavour choice per order. 3 Tiffin hearts £6.50 Both available in a variety of flavours such as Malteser, Mint Aero, Orange Aero, Rolo, Smartie…..
or another one of your choice. Order consists of one flavour choice. Tiffin hearts also available in a large size, same flavours available as before. Large fudge hearts, flavours available as previously, gift wrapped for £13. Large Brownie Heart- Crispy on the outside, dark and gooey on the inside. Let me know if you would like to order! Last orders taken on Sunday 9th February. Another Lakeland toy to play with? And it involves chocolate? Definitely count me in! I’ve had experience with making chocolates with a hard plastic chocolate mould before, but not with silicone, so it required a bit of thinking about how to go about it, as the methods I used for a rigid mould wouldn’t work so well with a flexible one. I decided to apply the melted chocolate with a paintbrush which helped get the chocolate in all the places required, especially with the more intricate designs. In hindsight, it may have been better to let this harden, and then apply a second coat, as a couple of the chocolates didn’t come out without breaking, but that’s something to try next time. I made a caramel sauce, and poured it into the chocolate mould once they had been in the fridge for about an hour (I was busy doing other things at the time, I don’t think it necessarily needs this long). I left a space at the top of each mould- I didn’t fill it completely to the top. And then popped the mould back into the fridge. After about half an hour, I melted more chocolate and added this on top of the caramel, then it went back in the fridge again to set. I tried to pop them out after half an hour, but this perhaps wasn’t quite long enough as a couple of them cracked on coming out, so I chilled them for a bit longer (this could have been down to having too thin a coat and not the chilling time- I will need to experiment with this). Second time lucky, the rest popped out without a problem, by pushing the mould from underneath. I’m really pleased with how they look! Not perfect, but pretty fab for the first attempt I think! I’d definitely use this mould again. The chocolates would be great for presents, not just at Christmas time, but for birthdays, Mother’s Day, and I’d also think about using them on my dessert tables. These are the simplest thing to make, super yummy , and give you a different way of presenting a dessert. You can make them savoury by omitting the sugar. You need about a tablespoon of butter, and a couple of teaspoons of sugar per tortilla. These are rough measurements, I didn’t measure exactly when I has making them, the method was a little rough and ready if I’m being honest. Preheat the oven to 160 degrees. Melt the butter in the microwave. Brush both sides of the tortilla with the melted butter, then sprinkle the sugar over the top. I used granulated sugar for some (for the children) and cinnamon sugar for the adults. If your tortillas are not very soft it may be an idea to soften them slightly in the microwave first as you need them to bend without ripping. 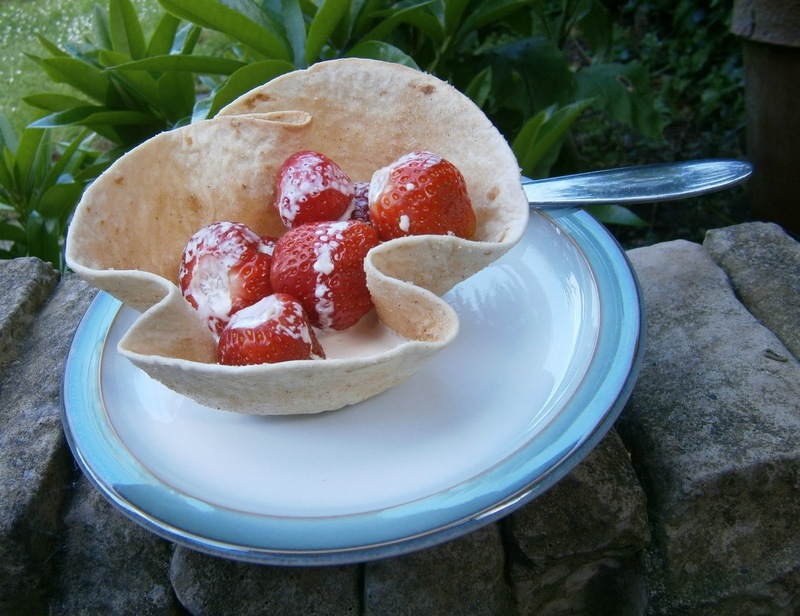 Then shape the tortilla inside an oven proof bowl, or over the back of a ramekin, or other suitable bowl. Bake for about 8 minutes, but keep an eye on them as you don’t want them to burn. Take them out of the oven and let them cool as they are for about 5 minutes, then transfer to a wire rack to cool completely. Then they are ready to use. 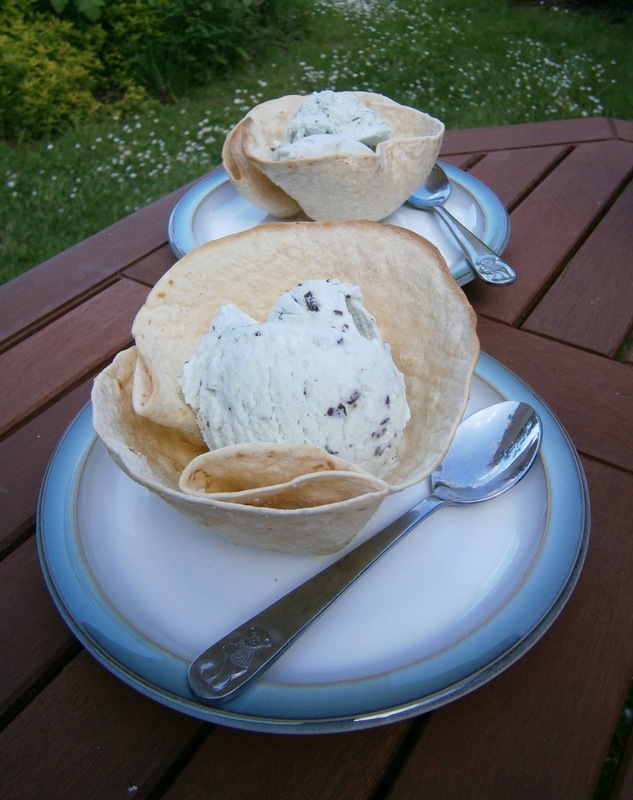 The kids had their bowls filled with mint choc chip ice cream…..